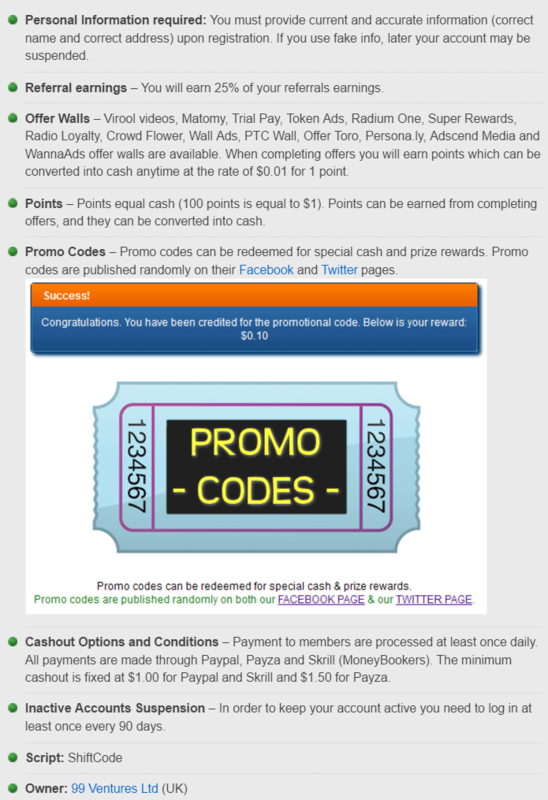 RewardingWays is Get Paid To program that pays its members to complete tasks and offers, surveys, to click ads, to participate and win in contests. There is referral system in place which allows users to earn commissions from the activity of their downline. Rewarding Ways has been online since 2010 and they are paying without delays or other serious issues. It is owned by 99 Ventures, internet advertising provider which also owns SuperPay, OfferNation and Clickfair. RewardingWays is the oldest site from their network however it will remain on the Legit List until all other sites from this network turn 2 years old. Fixed Low Minimum Withdrawal – $1.00 is the minimum amount to cash out and does not increase after each payout request. Great, there are no high minimum payment thresholds or stepped cash out system. Unlimited Affiliate Program – There is no limit to the number of users that you can refer to the site, which is excellent opportunity for members who can build a big downline. If you manage to do so, you can earn extra money without hard additional effort. Worldwide Service – Individuals from all over the world are allowed to join the site and earn with it. No need to buy membership to receive payment. Geotargeted Offers – Most offers are available for residents of USA, UK, Canada, Australia and Italy. If you are from some other country, you may get less offers or no offers at all for specific categories. Therefore, this site may be slow earner for you. No Forum – This site does not have a forum. In our opinion, a GPT site should have a forum. The forum is a place where members and staff can communicate with each other. Members can post their success stories or doubts, post payment proofs, share the experience that they had with the site, ask for support and stay informed about the recent changes made to the site. Usually, on the forum you can notice the first signs if something is wrong. If members complain about non-payments or payment delays, then most likely the site is experiencing problems. 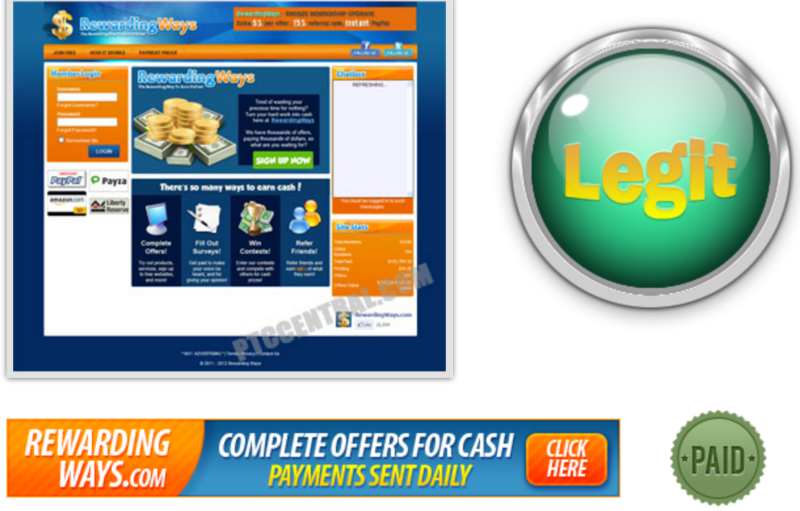 RewardingWays has proven to be a stable and paying GPT site. In our opinion, it is a safe site to use and earn. Please note, this site is not like the everyday PTC site. There will be ads to click, but if you rely only on your PTC clicks, it will be a slow earner for you. On the other hand, if you have the time to complete offers, surveys or tasks, you can earn few dollars daily. The availability of offers depends mainly on your geographical location. There are a few different types of offers available so you can give it a try and see how it works out for you. Be sure to comply with their Terms of Service. This site uses very strict policies and you may be suspended if you violate the Terms of Service. CLICK HERE TO JOIN REWARDING WAYS! CLICK HERE FOR PAYMENT PROOF!